A Russian worker has been filmed hand feeding a wild bear – and even exchanging a high five with the grizzly creature. The unnamed worker – seen wearing his overalls and a hard hat – can be seen talking to the unthreatening bear through a window in remote Kolyma, East Russia. 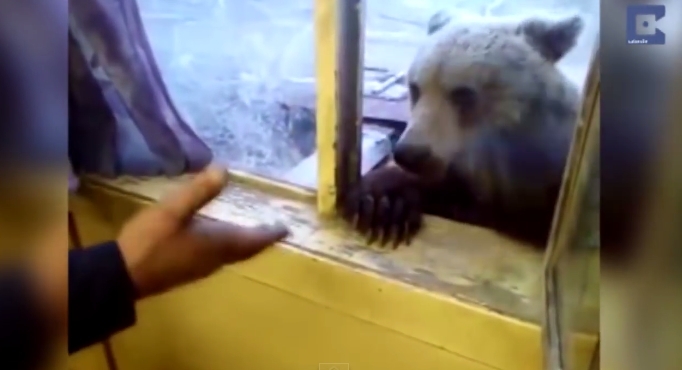 After chowing down on a succession of treats, the man asks for a high five – which incredible the bear obliges to. In an act of apparent friendship, the man and bear quickly clasp hands through the opening of the remote hut. Brown bears can grow to weigh more than 1,400lbs – the same weight as an average sized car.There are thought to be around 200,000 brown bears in the wild, spread across Russia, China, India, North America and Scandanavia. Lesson of the day - when walking in the woods, it may help to carry cookies. Responses to "Hungry Wild Bear Asks Russian Worker For A Treat (Video)"
What are those cookies made of they appear to be cement?